Are you looking for a sports bike that not only appears stunning but is just fabulous to ride, keeping you ahead of the others? 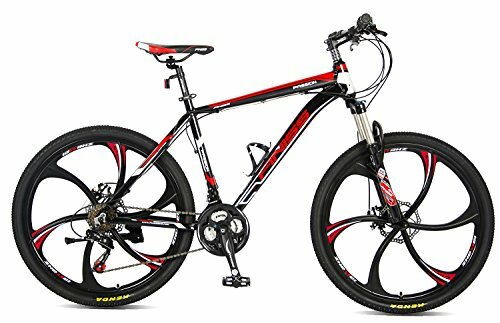 The Merax Finiss 26″ Aluminum 21 Speed Mg Alloy Wheel Mountain Bike is the right bike for your needs. From performance to looks, this bike has it all that is required to make you a proud owner. It is indeed a real showstopper and highly recommended. This is assured, much better when compared to your department store bike. Purchasing this bike is sure to be much beyond your expectations. When compared to other mountain bikes, you can find that the Merax Finiss 26″ does appear unique and different. Its stylish magnesium wheels and great looking features are sure to impress you. Moreover, it appears much more expensive than its original price!! You are sure to be left surprised by availing this affordable bike that is sure to make heads turn. Strangers and friends are sure to appreciate your decision to buy this particular model and brand! What makes this bike attractive and popular among bike buyers? can help you to stay informed and make the right decision. Also, you can derive value worth the investment. Why should you buy this bike when there are others in the market? If this question bugs you constantly, then going through the below can help you better understand as to why it is a fantastic purchase! Merax Finiss 26” Mountain Bike boasts of having a lightweight aluminum frame that makes it much easier to ride it without any difficulty. It also has an appropriately sealed suspension that comes with pre-load adjustment. A lockout has also been fitted for moving smoothly on a road or climbing hills. The bike’s magnesium wheels are designed in a manner never to require truing. Offering 21 speeds combined with Rapid Fire shifters, you can enjoy smooth disk brakes and shift. Even the drivetrain is quite excellent. Also, its manufacturers claim it to be a maintenance-free bike, which is its USP. Are you confused about how to use this product once you receive it from your supplier? With some tips, you can ensure that the bike can be utilized immediately. You are provided by the manufacturer instruction manual on how to assemble the bike upon receipt and to use it. You should not have the bike put together in the wrong way. You are to perform 180-degree turn similar to what has been instructed in the manual. Doing it slowly, but steadily following the step by step instructions given in the manual can help you to avoid committing mistakes and save plenty of time!! Ensure your front fork has been kept the right way that is to be turned 180 degrees. Merax Finiss 26” on the similar side that both the brakes are to be. In case, your brakes squeak, simply have the rotors cleaned, taking some rubbing alcohol or brake cleaner. It could be just the rotors and pads bedding in. In case, you find the brake performance not to be satisfactory; then you can have them replaced easily with hydraulic brakes. This is much easier than having rim brake bike converted to disk. Being a lightweight sports bike, the Merax Finiss 26″ is something that every sports enthusiast should have. This product is definitely recommended for anyone who is searching for a beginner mountain bike that comes with few flavors to it!! It is indeed an excellent bike to purchase or gift it to your near and dear ones. Also, it is claimed by its manufacturers to be maintenance free, something that comes to a boon to those, who find maintaining a bike to be an expensive and time-consuming aspect! It is wise to follow the instructions given in the manual to assemble the bike properly. You can also take the assistance of the professionals. This is one excellent bike that you should have with you! !